Are Kevlar ® Hoodies & Jackets the future? 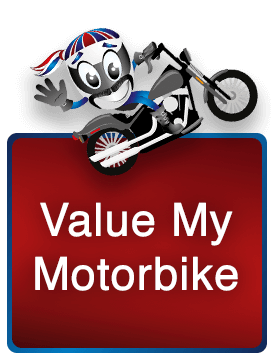 Motorbike Trader, We Buy Any Bike would like to say a huge thank you to LD Motorcycles for once again sharing this wonderful article with us… We hope you enjoy reading as much as we did! Earlier this year we claimed Kevlar ® was the biggest word on bikers lips in 2018, and so far we’ve been proven right. As retailers of all things motorcycle clothing, we have seen a massive upward trend in the demand for more casual motorcycle clothing. But making leather protection or textile look casual is not an easy thing to do, which is why most brands have turned towards Kevlar® as the best material to build gear that looks good and keeps us safe. It’s more than just a hunch of ours – 720 people per month now search for Kevlar® Hoodies in the UK. The aim of this post is to uncover why this change is happening and if casual alternative motorcycle jackets are really the future. In the simplest way, Kevlar® is a special fibre that provides effective abrasion resistance. For the full low down check out our other article on Kevlar® jeans here. What’s changing in the motorcycle world? It’s more than just a changing trend in motorcycling, but more about the change in the world as a whole. Due to fast advances in technology and the way we live our lives we’re always looking for products that make day-to-day life more convenient… Which has even spread into bikers lives although we’re usually immune to the ‘outside world’. There seem to be less and less bikers who like to get fully kitted out in 1 or 2 piece leathers for a fortnightly tear up and more bikers who are looking to commute or use the bike on a regular basis. That thought it supported by the fact that a lot of manufacturers are launching much more comfortable and street suited bikes than fully faired race machines. The transformation of how we ride our bikes in the UK has meant that more of us are looking for alternative ways to dress while riding. Clothing that can serve more than just the one purpose of safety clothing while we ride. Gear like lower, trainer style boots have been getting more popular for years now and even the major motorcycle clothing brands are taking notice. Add to this the option of wearing fashion styled jeans with a Kevlar® lining instead of heavy leather chaps. Even as far as Kevlar® lined flannel shirts – you can see why casual clothing is getting more popular among us bikers. Although Kevlar® jeans are the hottest topic right now when it comes to casual biker gear, there are a lot more options out there and more coming every season. 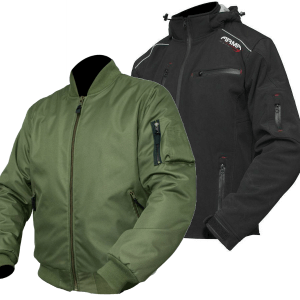 From Kevlar® lined bomber jackets, Kevlar® Hoodies, Kevlar® shirts and even softshell jackets. The #1 question around any motorcycle products and for good reason. So can Kevlar hoodies. For example, be as safe as conventional motorcycle jackets? There’s not really a straight answer to that question. That depends a lot on the type of Kevlar hoodie and Jacket you compare. If you consider the safety of a leather jacket that is designed for sport bike riders on the track and road. Then in the same circumstances, you shouldn’t expect an equal level of protection from a Kevlar hoodie. This might seem obvious but there is a worrying amount of us bikers who believe the world Kevlar translates to indestructible – which it definitely is not. However, when you consider that Kevlar hoodies and casual jackets are designed for commuting around town or popping to the shops. They will provide ample protection. What we’re trying to say is, don’t expect race protection from a casual jacket at a quarter of the price. When it comes to motorcycle clothing, right now leather and textiles will continue to dominate no doubt. But as times change and a new wave of motorcyclists enter the market. Our predictions are that we’re going to see a lot of differences in the way people want to dress when they ride. We could possibly see the first time that the motorcycle industry and general fashion trends start to see a real crossover. 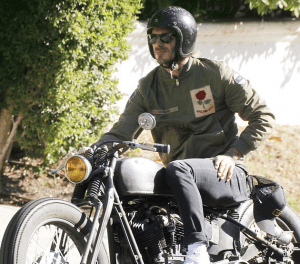 This cross-over has already happened in the cafe-racer-urban-cruiser world within the UK, with more and more cafe racer style bike shops and bikers popping up… even David Beckham. Now that we’ve predicted that it’s all going casual… Let’s get down to the real question. What actual casual clothing trends will mark the future of motorcycle clothing? Hoodies are a pretty future proof bit of kit in general fashion. They are most people’s first choice if they want to leave the house in something warm and comfy. And it’s the same for us bikers. The first factor that we all consider when buying new gear is how comfy it is. There’s nothing worse than riding in something uncomfortable. Which is why Kevlar hoodies are gaining in popularity all the time across the UK and even Europe. Most current hoodie offerings come complete with CE protectors in at least the elbows and shoulders. With a ready-made pocket to add back protectors as well. In exchange for comfort and style. You do give up some protection that a hoodie can’t deliver over a leather jacket. But for the shorter, slower journeys a hoodie seems a perfect idea. Since Kevlar® linings can be added to nearly any piece of clothing the options are limited only to what brands release. Up until recently, there were only a few different styles of casual jackets on offer. But in 2018 we have seen some great new additions like the ARMR Bombers and Sukuta softshell jackets. As far as the future of motorcycle clothing we believe this is where we’ll see things head in the future. Exploring more options for casual motorcycle clothing is a natural progression. As we see more interest in these alternatives at LDMotorcycles.co.uk. But unfortunately, we can’t put a date on it since we don’t know what brands like Richa, HELD, ARMR. As well as others have cooking in their R&D departments. It’s always hard to make predictions when it comes to the motorcycle world. With changes in road law and general law having big large impacts on different aspects of riding. 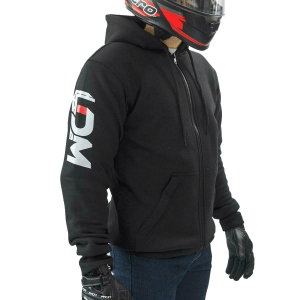 Also, with the possibility of an impending CE certification requirement coming in to place across all motorcycle clothing, we could see limitations to the options of casual clothing. But on a slightly more positive note, at LDMotorcycles.co.uk we’re excited. To welcome the changes in biker style as we continue to develop new products with our LDM range. See all our Kevlar jackets at LDMotorcycles.co.uk here.